The Gardener's Journal: Try BEFORE You Buy - Why Test Drives are Recommended! In the same way that a new car should ‘fit’ in with your needs and circumstances, so should a garden tractor. Even if you have completed your due diligence, researched online, spoken with friends or visited your local dealer, nothing can compare with actually driving the mower in your own garden. Not all garden machinery dealers will conduct demonstrations at your home, but most will and it is always recommended that you ‘try before you buy’. Here are ten things to check during your lawn tractor test drive. 1. 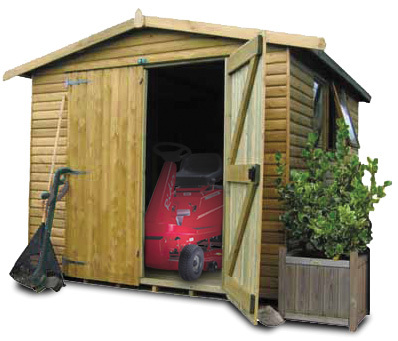 Can you easily access your garden with the lawn tractor or ride on mower? Narrow gates, paths and obstacles may block access from the shed or garage to your garden. You will need to check that the model you are purchasing actually fits your garden. 2. Will the mower cut all the areas of your grounds? Don’t limit the demonstration to your main lawn. Mow in your orchard or perhaps in your paddock where the grass is kept a little longer. You may find that you need a high grass cutting deck or a more powerful lawn tractor to cope with the different conditions. 3. How easy is it to empty the collector? The mechanism will feel very light when the collector is empty in the showroom. Fill the collector bag full of wet cuttings, then try emptying it - it might be a different story! 4. Does the cutter deck or collector clog when mowing wet grass? In Britain, the grass is more often wet than dry. Make sure that the machine you are considering can cope in these conditions. 5. Is the deck wide enough for your garden? A larger deck means fewer passes to mow your lawn (and more time relaxing on a Saturday!). Mowing a larger lawn with a small deck will become very tedious after just a few weeks of owning your new lawn tractor. 6. How comfortable is the ride? Through the summer months, you could find yourself spending many hours in the seat. Check to make sure that the ride is comfortable. The seat position should be adjustable to suit your leg length and the seat should be independently sprung to absorb the worst of the bumps. 7. Is the lawn tractor easy to operate? Your dealer will be able to instruct you on the operation of the mower. It should feel intuitive to use. Foot control for forwards and reverse is a must. Make sure that the controls are within easy reach and that you understand what they all do. It is always advised to invite other family members to take part in the demo. Check to make sure that they understand the controls too - after all, they may end up using the mower more than you! 8. How noisy is the ride on mower? An excessively noisy mower can become very irritating for you as well as your neighbours. With stricter noise regulations in place, some manufacturers have to resort to turning down the power of the engine in order to comply. Check with the dealer during the demonstration that this is not the case with the machine you are considering. 9. Cutting performance - Not all lawnmowers are the same and the cutter deck and collector design will affect the cutting finish. If you mulch mow, check that the clippings left behind are fine enough not to be barely noticeable. When cutting and collecting, ensure that the collector is up to the job - there should be hardly any clippings left behind. 10. How versatile is the machine? The best thing about a lawn tractor is that it is highly versatile. The best models have a power take-off to drive powered accessories, but at the very least, ensure that the machine you are trying has a tow bar. A trailer is an absolute must for any gardener! One of the benefits of buying a car is the opportunity to test drive it. By taking advantage of this, you eliminate the risk of returning it because of some defects that are unseen during ocular inspections. Testing a car before buying it is wise since you'll know whether it's really the car for you or not. It's also advisable to know if it has a motor insurance because motor tend to have problems from time to time. When I bought my son a ford in Stockport, I made sure he drove it first to test if it was the car for him. His test drive lasted for 20 minutes before he decided that he wanted it. Test drive is important to give you a better idea on what to expect from the car you want to buy. My dad is the only driver I'm comfortable with when it comes to long drives. I just had my first car and my dad did the test . He was very keen and observant that he even agreed on those no credit car loans deal just ton see the perfect car for me. Thanks for sharing the information.I liked the way you have presented your point of view.The image shown above is really very impressive and outstanding.